There is a lot of children’s literature out there. I tend to select classics from my youth or explore new titles by such authors for my children. I think life is too short of bad literature. Often, we are sent children’s literature for all ages to review that attempt to convey a green message or theme, but these books usually disappoint in confusing plots and characters leaving little personal connection for readers. Not so with The Order of the Trees!
. The author Katy Farber was formerly a writer on Eco Child’s Play, and I always enjoyed her posts. Katy is a teacher and has a wonderful blog called Non-Toxic Kids. 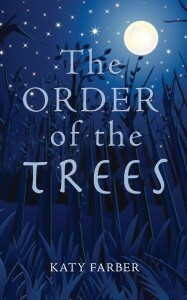 The Order of the Trees is written at a middle school level. I read it quickly on a plane flight to Maine to visit Tom’s of Maine. It is a story any human can relate to…we have all felt like the odd one at school, found a place that give us comfort, felt fear and anxiety when that place is threatened, needed a good friend, etc. The main character in The Order of the Trees is Cedar. Found as a baby on a bed of moss under an old-growth tree, Cedar’s beginning was a mystery. As she began her sixth-grade year, Cedar resembled her namesake with her wild mane of brown hair, her sinewy body, and deer-like eyes. She makes her first true friend, a new student, Phillip, with whom she shares her special woodland spot along with the gifts it brings. When Cedar suddenly falls ill, Phillip discovers that her health is con- nected to the fate of the forest where she was found. Their special woods are threatened by an impending development, so to save it they create a plan that includes a hospital, a getaway car, and a protest. This is a great story of friendship, as well as embracing the uniqueness of one’s self. The middle school years are typically a time of conformity. Cedar’s spirit and love of the forest gives strength to her friend Phillip to do what he might not do otherwise. Phillip emerges out of his shyness to save Cedar. He breaks her out of the hospital and organizes a protest rally to save the forest where Cedar was found by her parents. As I mentioned before, many of the “green” books we receive are confusing. Not so with The Order of the Trees. Each character is believable, it reads smoothly, and it is well written. Another problem I have with many of the “green” books we are sent is they are not actually published by eco-friendly publishers. The Order of the Trees is published by Green Writers Press. We are a Vermont-based, global publisher founded by writer and environmental activist, Dede Cummings (from Brattleboro, Vermont), to incorporate and facilitate the gift of words to help foster a sustainable environment. It is our mission, at Green Writers Press, to spread a message of hope and renewal through the words and images we publish. Printing on demand (POD), and using only FSC-certified papers printed at our Vermont printer, Springfield Printing Corporation, and at our Tennessee printer, Lightning Source, we will adhere to GWP’s commitment to preserving and protecting the natural resources of the earth. To that end, a percentage of our proceeds is donated to the environmental activist group, 350.org. We also give a percentage of our profits directly to Vermont-based environmental organizations. Fictional but still inspire environmental advocacy, published by a true green company, The Order of the Trees is an excellent book. Congratulations Katy!